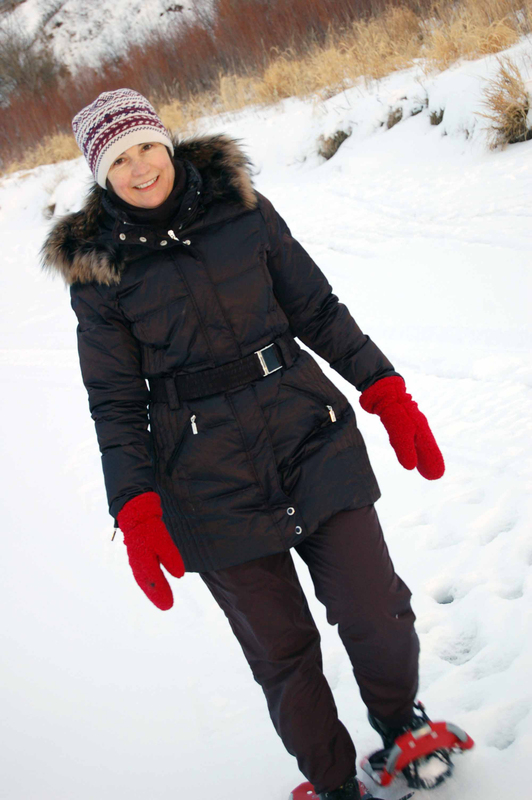 We’re often asked about what kinds of winter activities our residents partake in here at Sarilia. 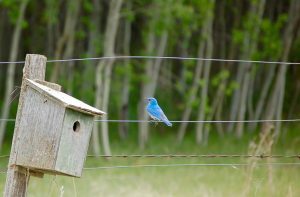 In fact, that’s one of the most appealing things about living here in the river valley–nature is right on our doorstep. We don’t have to get in the car and drive somewhere else to experience it. And the kids here love to head for the hills to toboggan. We asked a few of them (Gwen’s grandkids) what their favourite winter activity is. Here are their answers. Jackson (age 11): Having fun with the people in my life that I care about the most. 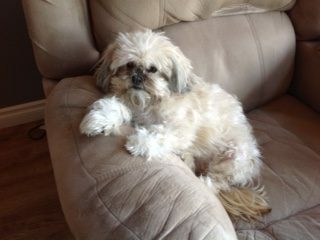 Bentley (age 5): I love doing canon balls down the hill, being outside, playing with my cousins and racing up and down the hill! 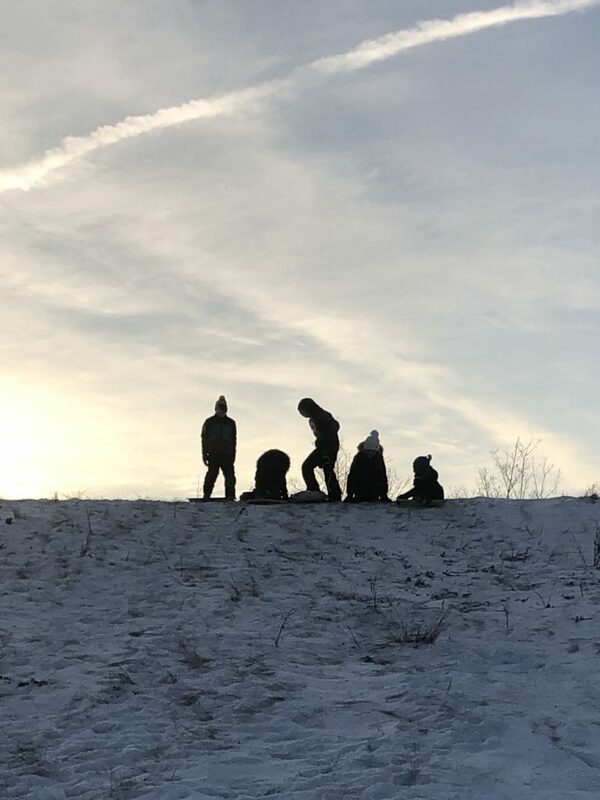 Hannah (age 11, white toque): Just being with my cousins makes me HAPPY! 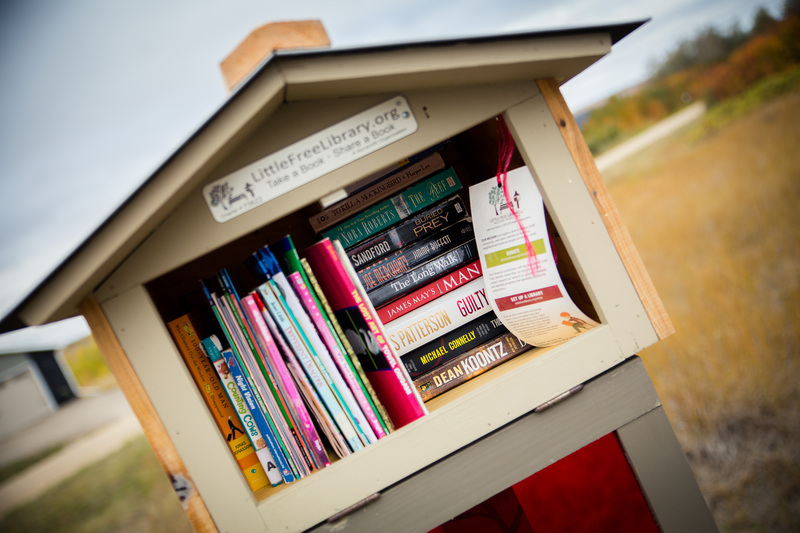 Sarilia is home to a lot of book lovers, so what could be better than building a Little Free Library (LFL) for our residents to share their love of reading? This summer, a group of residents got together to create one of these “take a book, share a book” exchanges right here in our community. Our library is now registered on LittleFreeLibrary.org. Kayla and her daughter Wren are two resident bookworms who love Sarilia’s LFL. We chatted with Kayla to get her thoughts on this new community building project. What do you think about the new Little Free Library at Sarilia? I think it’s a great addition to our community. 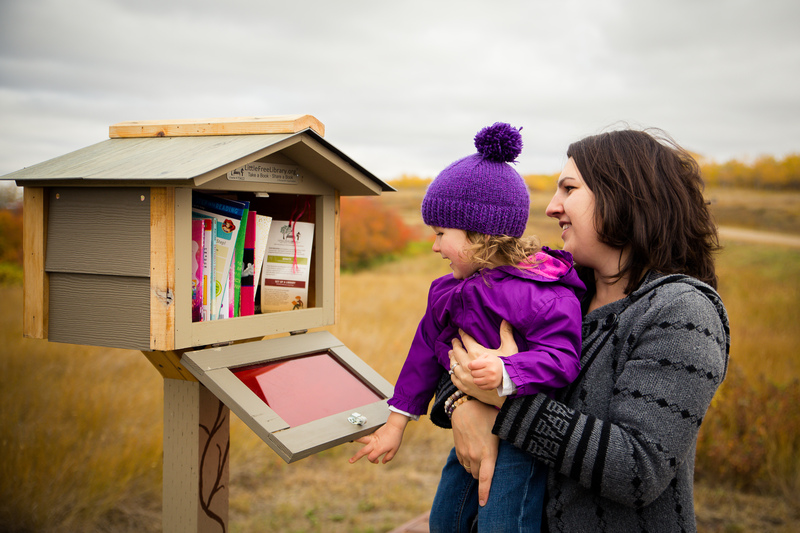 Literacy is so important for everyone and it’s in a great area to just stop and grab something while out for a walk. What was your daughter Wren’s response to it? She loves the little library. Wren gets super excited when we go down to see what’s new. 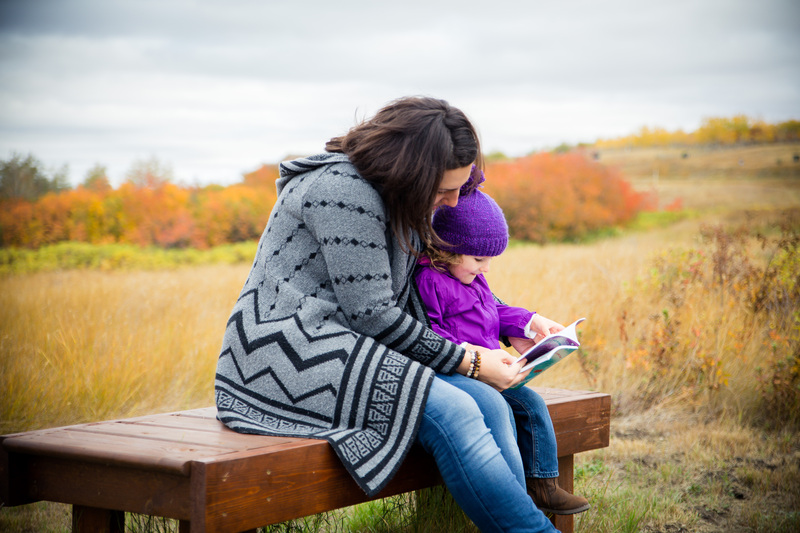 Do you do a lot of reading at home with your daughter? We are constantly reading, I’m a bit of a book worm and she’s definitely picked up that trait! 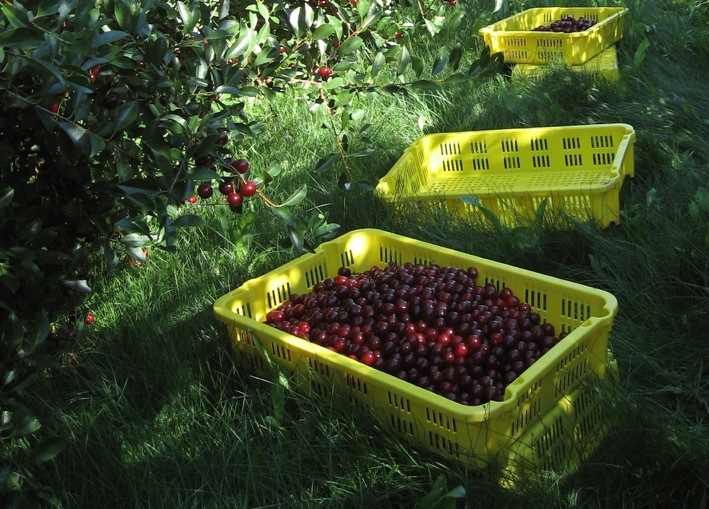 It’s cherry season in Saskatchewan and here at Sarilia we’re fortunate to live right next door to a u-pick cherry orchard. 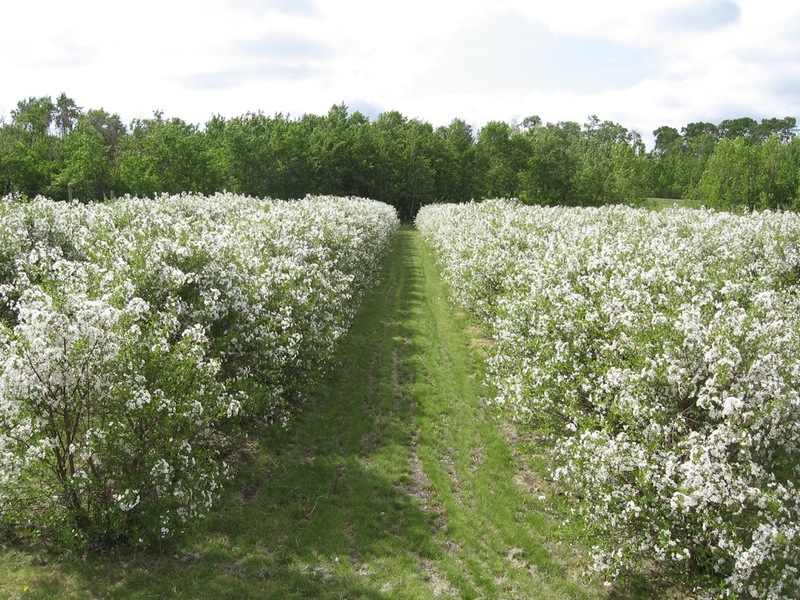 Owners Ed Bueckert and Anna Rehan planted the first trees, a variety called Carmine Jewel, in 2000. A few years later they added new varieties, including Cupids and Juliettes. “It took about six years before they started producing to a point where it was a commercial operation,” says Ed. In addition to the u-pick, Ed sells their cherries to local wineries, restaurants and to food services at the University of Saskatchewan. We chatted with him to glean a little more insight into the delicious cherries he grows right here in the prairies. What time of year are the cherries ready to pick? Usually the beginning of August. What are some of the beneficial properties of sour cherries? You hear about antioxidants and their benefits, and cherries are really high in antioxidants. They’re also rich in melatonin, which helps you sleep. And there’s research being done about athletes using cherry juice and to speed up muscle generation, but that’s in a research stage. What kind of volumes do you grow each year? It varies quite a bit. Right now, I’m in the process of rejuvenating my orchard. Some of these trees are 18 years old and they’re getting too tall and the stems are getting too big. So, what I’ll be doing every year, is cutting down a row of cherries, and they come back really quickly—they regrow from the roots and so, my production right now isn’t as big as it was at one time, but I’ve produced as much as 6,000 lbs. a year. It’s less than that now because not all of my rows are in production. It takes about three years for them to come back into producing after I’ve cut them down. What other varieties perform well in our climate? The University of Saskatchewan initially came out with Carmine Jewel. And then some years later, they came out with five varieties they call the Romance Series of cherries. In that series, there’s the Cupid and Juliettes. But there’s also Romeo, Valentine and Crimson Passion. Do you grow anything else? We grow apples, raspberries, strawberries, haskaps, but not commercially, that’s for our own benefit. I have 30 bushes of haskap, but the cedar waxwings are just tenacious. If you don’t net them, and net them really carefully, if there’s any little hole, they’re in there. They will clean them off—they’ll eat them till they’re all gone. Do you have a favourite recipe for your cherries? We make a sort of pie filling, but we use it for a variety of things. Like as a dessert topping, an ice cream topping or on cheesecake and that sort of thing. It can also be used in pies. You just add a little bit of thickener to it, like modified corn starch and a little bit of sugar and that’s it. It’s a pretty simple recipe and then it can be used for a variety of things. And we can some of that so we have it around for serving dessert. We also dry a lot of cherries. They’re really good in salads and I use them every morning in my cereal. 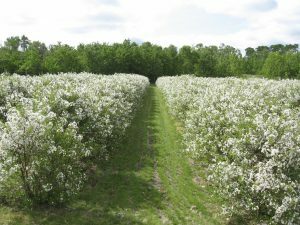 How long is the cherry season on your orchard? We probably have cherries all of August. The Carmine Jewel are the first ones that come, so we pick those first, and then the Juliettes. The Cupids probably aren’t ready to be picked until the middle of August. They will last just about to the end of August. The Cupids are more for fresh eating, they’re the biggest cherry that we have, and probably the sweetest. They don’t pit very well because their pit is shaped differently. So, we use those more as a fresh eating cherry, and they taste pretty good. They’re sweeter and they look nicer. But for processing I still think the Carmine Jewel are probably the best. Their flavor is really intense, although they’re quite sour—but for processing, that works in their favour. 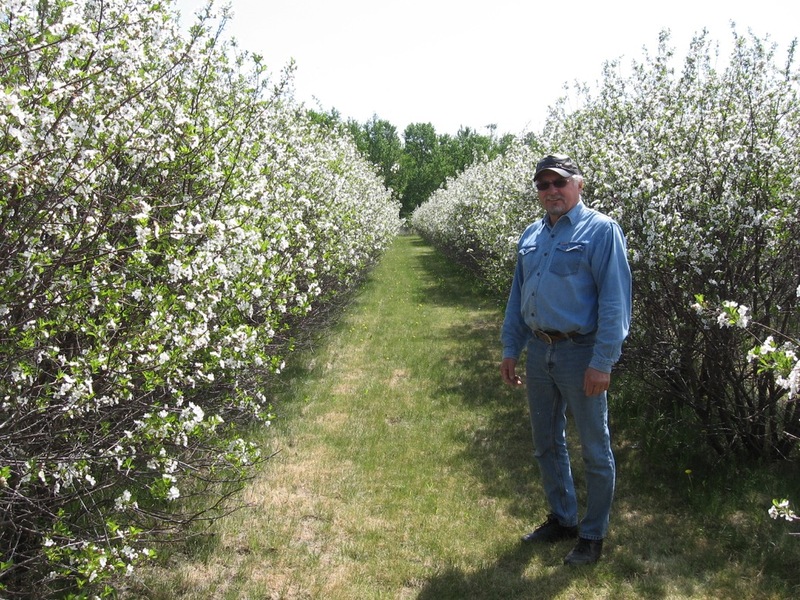 *Unfortunately many cherry growers in Saskatchewan, including Ed and Anna, have had problems producing cherries this year, likely due to winter conditions. Their u-pick is not open this season, but they are still selling pitted and frozen cherries. 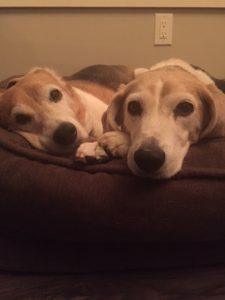 Matt and Amber moved to Sarilia three years ago, with their two adorable beagles, Tucker and Peaches (who’ve been featured in a previous blog post). Their family has since expanded with the birth of their daughter, Summer Belle, four months ago. 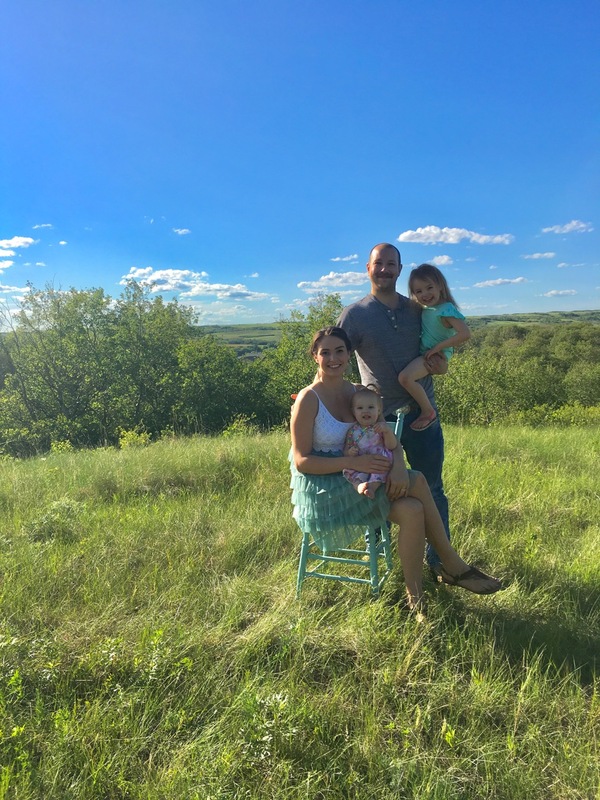 We chatted with them when they originally moved here, and decided to follow up with Matt recently to see what their life looks like, after three years of river valley living. Was there anything that surprised you about life at Sarilia? My dad has lived here for 10 years so I had a pretty good feel for it. What are the main lifestyle differences when it comes to living at Sarilia versus living in the city? The exposure to our river valley ecosystem, bird watching, deer herds and the cows! We love the tranquility and being a step removed from the city. The stars and moon are brighter. What kinds of activities do you like to do at Sarilia? Walking the trails, fishing and biking the grid roads. How would you describe your social lives at Sarilia? We have some great friendships at Sarilia and we look forward to meeting new neighbours as we continue to grow. Can you describe your perfect weekend at Sarilia? What would you do? It depends on the season or mood. Relaxing by the fireplace is perfect on a snowy, frigid day. Anything outdoors makes me happy in the summer months—even just putzing around the yard. Gwen tells me you and Amber have a new baby. Congrats! What do you think it will be like to watch Summer grow up at Sarilia? We’ve purchased the lot next door to us so it’ll be awesome to have even more room for her to run around. I hope living at Sarilia instills an appreciation for nature. It takes a certain kind of person to live in the country. It’s a decision that’s proving to more rewarding as time passes. 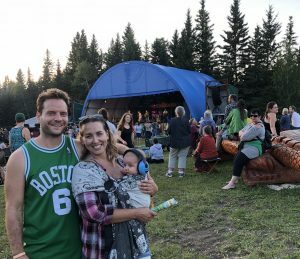 Shayna and Sheldon both originally hail from Hudson Bay, Sask. Like many of our residents, they relocated to Sarilia from Saskatoon to rediscover the small-community lifestyle in which they were raised. 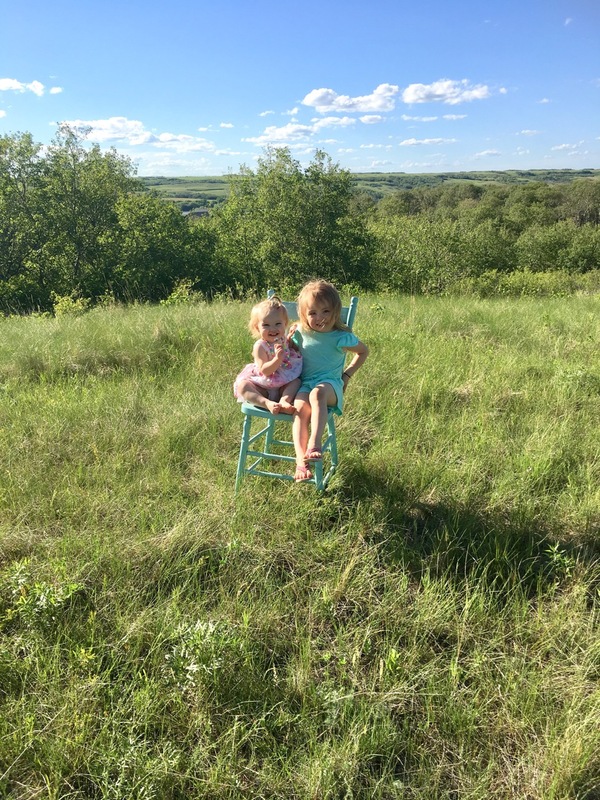 They settled into our river valley community last July with their two young daughters: Gemma is four and Daisy is 13-months. Sheldon works in Saskatoon, and Shayna is a stay-at-home mom who runs a part-time daycare from their new home base. We chatted with them to learn more about their decision to move to Sarilia, and how they envision their family’s lifestyle here—this summer and beyond. What was it about Sarilia that made you decide to build a home here? Shayna: The natural landscaping. 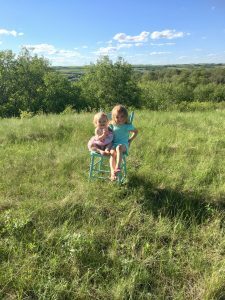 For close to a year we drove around Saskatoon and looked at several different estate developments and when we drove out here… just the views, like when you come down the road into Sarilia, you can see all the rolling hills and you can see right down to the river. 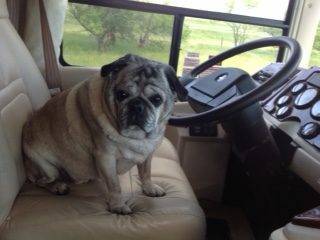 We drove around and Sheldon knew he was in trouble—I fell in love with it. My heart had made a decision already, but we didn’t make a final decision for a little while. We obviously talked about it and we met with Gwen, but I knew pretty instantly that I wanted to move here and Sheldon knew quickly that he was going to have to figure out if we could do that! Was there an urge to get out of the city? Sheldon: We’re both from a small town, so the city was not really for us. Shayna: We had done the city thing. We both grew up in a tiny town and thought that we wanted the exciting city life and we enjoyed it for a couple of years when we were first married and we didn’t have any kids. Eventually, we realized it wasn’t quite for us. Especially after Gemma was born, we started feeling that calling to have more space and be more connected to outdoors and have a smaller community feel. Now that you’ve been here almost a year, how has your lifestyle changed? Shayna: It’s just a little bit quieter. It’s easier to enjoy the outside time. In the city, to enjoy nature, to see the river you go down Spadina, or you go for a walk or go to a park, but that was really the only way to get that nice, quiet outside time. And even then, it’s still busier, whereas here, we just go out onto one of our many decks or go into the yard or walk down by the river. You don’t need to drive anywhere to get that peace, it’s right here. Outside of that, we’re homebody-type people so our lifestyle didn’t change a whole lot. Sheldon: I work in Saskatoon. Shayna: I’m a stay-at-home mom but I do have a part-time daycare. I’ve got a few different families who bring their kids out part-time, so usually three days a week I’m open. So, you’ve already spent one summer here at Sarilia? Shayna: We did, but we didn’t. We had a baby the previous May so when we first moved out here she was still quite fresh and delicate so there was still a lot of working around her naps and feedings. We couldn’t go outside for too long, so this summer is going to be kind of a first. What are your plans for your this summer now that you’ll have more flexibility? 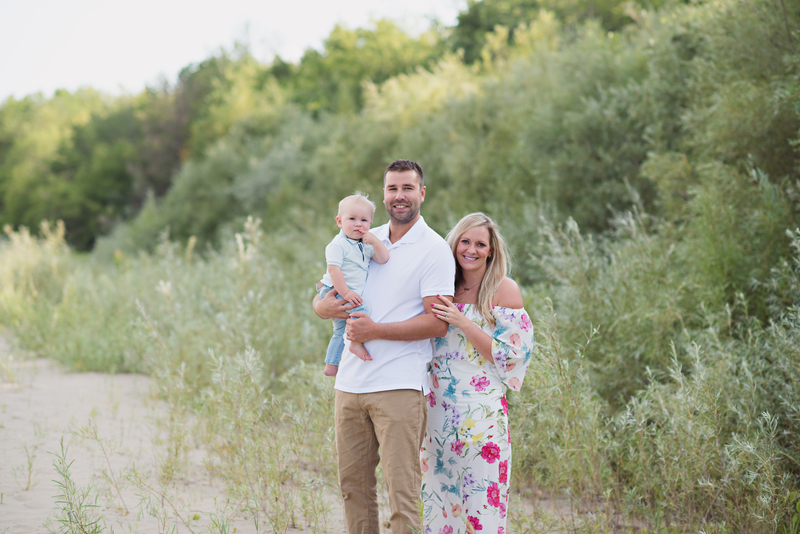 Shayna: Just going for walks down by the river and those basic things—just spending some time outside as a family without having to go anywhere. We don’t have to pack up the kids; we don’t have to pack up all the things and go. 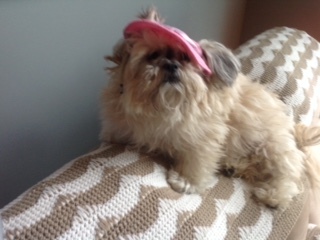 We just put on our shoes and our hats and go outside. As your kids get older, what kinds of activities do you want to do with them at Sarilia? Shayna: We’re going to be putting in a garden this year. We both love getting our hands dirty and Gemma’s looking forward to being able to put in a much bigger garden this year. Last year we missed the opportunity because when people were planting in May, I was 40-weeks pregnant and couldn’t touch the ground! This year we’re excited to put in a larger garden. When the kids get older we’ve talked about canoeing and other activities, but some of those things right now—the safety and logistics of doing it—we’re not quite there yet. But as they get bigger, being able to explore the river is definitely high up on the list. What do friends say when they come to visit? Sheldon: Shayna has a friend from Ireland who just loves it out here because it reminds her of home. Shayna: Yes, with the rolling hills and everything. How did you come across Sarilia? Shayna: In one of our many searches, Sheldon found Sarilia online and on one of our weekend drives of exploring, we came out here and the rest is history as they say! Tessa and Brad moved into their new home at Sarilia this past December. They have a nearly two-year-old son named Lukas, and a baby on the way in the coming weeks. Tessa grew up in a small town, while Brad grew up on a farm. 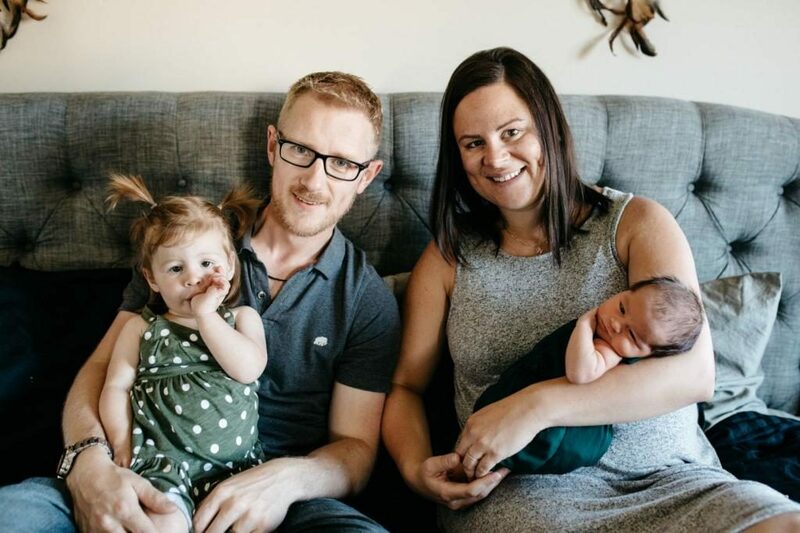 They made the move from Saskatoon to our river valley community because they wanted their kids to grow up like they had—connected with nature in a smaller, close-knit community. We recently chatted with Tessa to glean what kind of lifestyle they’ve found at Sarilia, and what they’re most looking forward to doing during their first summer here. What made Sarilia stand out among the other developments and acreages outside Saskatoon? The river. That’s probably our top reason—being close to water and being able to walk down to the river. Also, many the lots here have a lot more trees than other acreage areas. It’s also close to a town—in some areas you’d still be driving your kids into the city, say for school or for sports or that type of thing, but Sarilia is so close to Langham that it’s not necessary. How did you originally hear about Sarilia? We Googled “acreages” and “estate areas” and looked at everything. My husband grew up on a farm so he didn’t want the huge acreage life. We wanted to be out of the city and to be rural, but our careers are in Saskatoon so it had to be close. We looked all around at different developments and we loved the fact that Sarilia was by the river. What are you most excited about for your first summer at Sarilia? Just being outside and enjoying nature and having a view from our deck. To be able to explore the area, plant a garden and have a baby! What do you hope your children’s lives will be like at Sarilia? More of that small-town kind of community. You know, knowing your kids’ friends’ parents and a more rural upbringing. Brad and I never grew up in the city so we knew that was something we didn’t really want for our kids. We wanted what we had growing up, and it’s basically the simple life. It’s being more connected to nature and growing up in a smaller community. Are there any activities you’d like to do out here? We love canoeing, so we can’t wait to get a canoe. We usually do canoe trips once a year—overnight canoe trips on the river. We can’t wait to eventually take our kids canoeing or maybe kayaking when they’re older. We’re looking forward to having bonfires. We have snow shoes for the winter and that kind of stuff. Brad just told me they have ski trails out here, which I never knew about either. How has your lifestyle changed since moving out here? Brad had some friends over recently and our windows were open and one of his friends said, “You can just feel the air off the water.” It’s like when you’re in the mountains breathing the fresh mountain air. This is like that. It’s calming and peaceful. What else to friends and family say when they come visit you? My friend came out here and said the view was just unreal, even from inside our house. Pretty much everybody says the view is just amazing from our house—from sitting in our living room, in our kitchen, or on our patio. 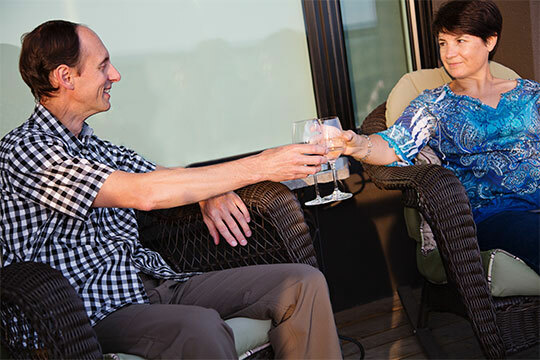 We have a wraparound deck and everybody says the view is just spectacular. How would you describe the perfect weekend at Sarilia? It would probably just involve hanging out with my family, having a bonfire and a picnic down by the river, hiking down the nature trails and relaxing in our backyard or on our deck. Pretty much that’s what we will do this summer. We came out here a lot when we owned the lot. We’d pack a picnic and go down to the river. 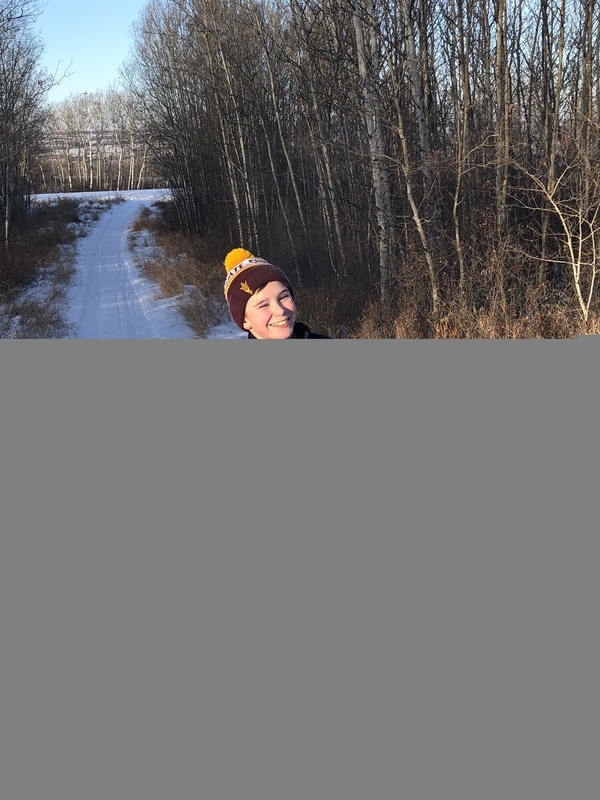 Al and Annette are two of Sarilia’s longest residents, having moved to the river valley community over seven years ago to experience what Al calls “pre-retirement.” We chatted with them to get a glimpse of what that lifestyle transition looks like. What made you decide to move from Dalmeny to Sarilia? Annette: The beauty of the river valley and the new community that was being developed here. Al: I thought we should try to experience pre-retirement. How does living at Sarilia contrast with city living? Annette: We really like the socializing and being able to know our neighbours. People look out for one another: they watch out for your property, and do nice things for each other here. What would both of you say are your favourite aspects of living at Sarilia? Al: My favourite aspect is just being near the outdoors without having to go far—compared to the city. Annette: You don’t have to drive anywhere to go to a park—it’s right outside your door. You’re surrounded by nature and wildlife. Al: The other aspect I like about Sarilia is, some years ago when we were looking at recreational properties elsewhere, prices were starting to skyrocket. We couldn’t justify spending a lot of money on a property at the lake, maintaining that, and maintaining another house. But here, it’s kind of like being at the lake. It’s the same sort of environment but without the expense and the driving and all the rest that comes along with lake property. What are your favourite winter activities at Sarilia? Al: We like to go cross-country skiing and snowshoeing. When we have decent snow, our neighbour Dale cuts ski trails down to the river. Annette: There are nice trails down by the river and we hike them a lot. It’s fun to see all the changes that are happening all the time—the change of the colours with the seasons, the migration of the birds. What are you favourite summer activities? Annette: Gardening in the summertime is fun. We always see some of our neighbours at the garden—we chat and play music. There’s a nice social aspect to it that I really enjoy. We also like watching the skyline at night—we can still see a faint light on the horizon in the evening and the stars shine brighter. Al has a telescope and he likes to gaze at the sky—picking out different clusters and planets. Al: We also try to get out in the canoe a couple of times in the summer. Annette: Canoeing from Borden Bridge to Sarilia is a lot of fun. It takes 2-3 hours usually—more if you want to sit and have a picnic on the side of the river. Al: I try to get out on my bike. 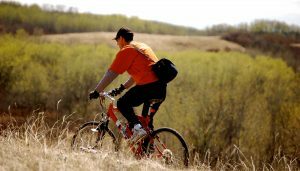 Once you get down in the river valley you can bike the trails that are down around the river easily enough. Annette: Biking down a country road is kind of fun—there’s not a lot of traffic that you have to worry about. Can you tell me about curling in Langham? Annette: Al’s been curling in Langham a little bit longer than I have, but the last couple of years we’ve both been curling. Al: They’ve got a new rink, and a pretty good club there. Annette: It’s a really nice facility. Al and I curl there in the mixed league, and when we can, we’ll take in a bonspiel. Even for those who don’t curl, if they like watching curling there’s an opportunity for people just to come and have a beer and watch curling because they have a nice little bar. We’ve enjoyed socializing with people from Langham at the rink. You both take a lot of beautiful photos around Sarilia. What inspires you? Annette: It’s just the natural greenery and the colours out here that we really enjoy. Especially in the springtime, the leaves are starting to pop out of the trees and the blue birds are coming back. Al: Because we’re at the river, you get migratory birds. You see them coming and going all the time. 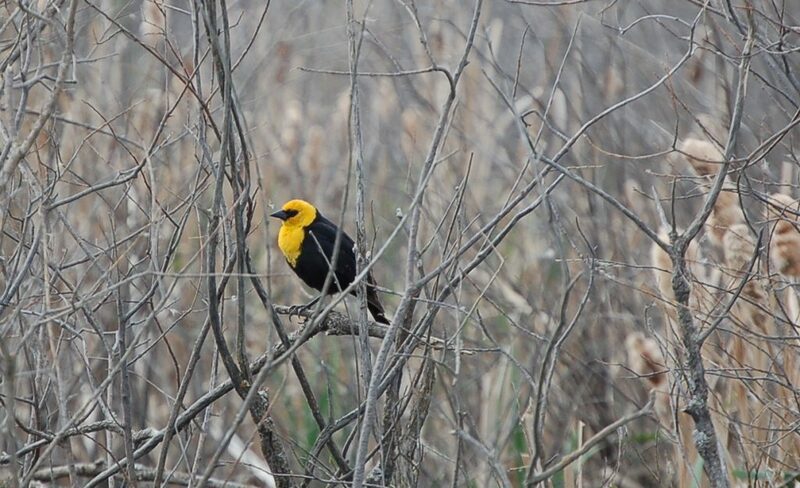 Here we might see a few more unusual birds because there are less people than in the city. In our book, we write down every spring and fall what we see, and I can go look in my book and I can say, “yeah, we saw that last year, and the year before.” It’s almost always within plus or minus a week. Annette: And there’s a lot of deer around here as well, so we know where they are and what time of day to watch out for them. Michael Pollan, a food writer and journalist, only eats meat about once a week. When he does eat it, he’s careful to purchase it from farmers who raise their animals humanely. “But it’s delicious, it’s nutritious and I think there is a place for farms where animals get to live a good life and, as the farmers like to say, have one bad day,” he says. The cows are co-owned between three Sarilia residents: Jordan, Joe and Gwen. 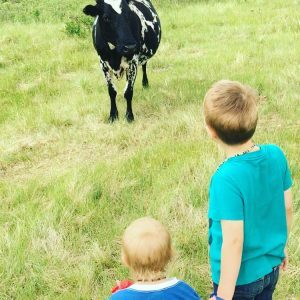 We recently chatted with Jordan, to learn what it’s like to raise cattle in our river valley community. 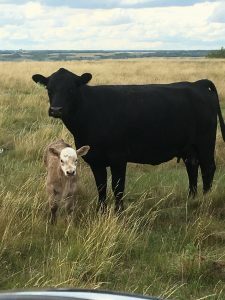 How did you get involved in cattle raising? I was born and raised on a cattle/grain farm. I’ve always enjoyed the cow side of farming so it was kind of nice to have a little bit of agriculture at Sarilia. How would you describe the pasture to someone who hasn’t seen it? It’s really quite pretty down in the coulees and the natural spring that runs through. It’s really a great place for a picnic actually. It’s just peaceful. I take my boys out and they feed the cows. It’s just kind of nice. There’s no cell service so it’s quiet. What kinds of cows have you been raising at Sarilia? 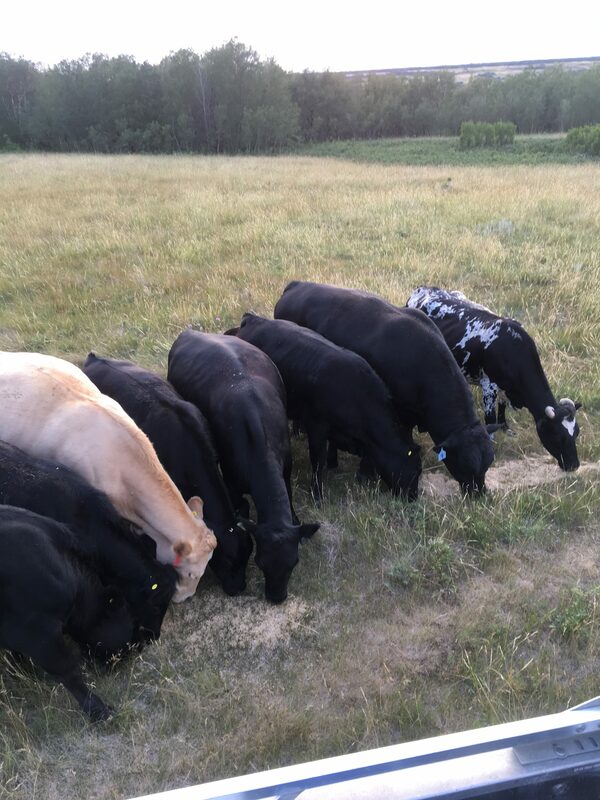 This year we had four black heifers and two black angus cows, one speckled park cross cow and one Charolais cross cow. We also had a bull, temporarily, that we borrowed from a friend. How old are your boys and what do they feed the cows? Jaxon is five and Nash is one. We take oats to them once and awhile. They like to do that. I wish they were a little more scared of the cows (laughs), but they like it. It’s just natural grasses, and a block of salt for them. I give them oats probably once every two weeks. Just to get them used to (people) coming up and keeping them calm. Do you name the cows? 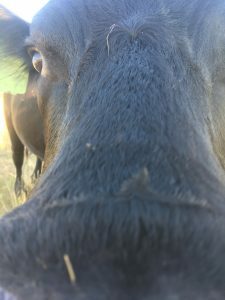 What is it like to co-own the cows with two other Sarilia residents? It’s a lot of fun. We’re all partners. It works out really well. That way, if something happens to one animal, someone’s not out a whole animal, we’re all out a little bit. But that hasn’t happened. I’ve gotten to know Joe and Gwen really well through it. What do you end up doing with the meat? We make roasts, steak, ground beef and sausage. Joe likes liver so he takes the liver. What have been the benefits of raising the cows here? It’s good camaraderie with your neighbours. It’s good bonding with my boys, to take them out. It’s fun to watch the cows grow and how they really get used to you and learn to trust you. I really enjoyed checking on them in the summer and taking them oats. Just kind of watching their progress. It’s probably nice to know where your food is coming from. Exactly. And we know they range free all summer and they’re grass fed, so the meat is pretty lean. It’s nice to have control over your food. We’re going to do a few fundraiser cows, with all the proceeds going back into Sarilia—whether it’s boardwalks or building warm up shacks for ice rinks down on the river. We have our fair share of four-legged friends here at Sarilia. 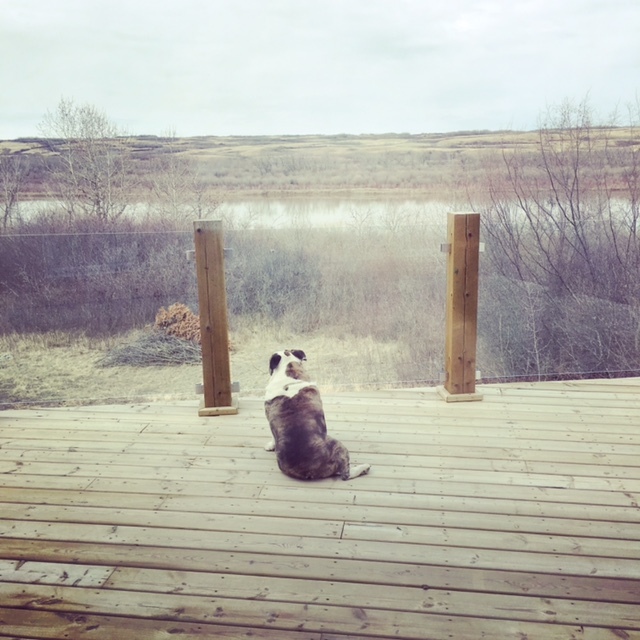 In fact, many of our residents say that the dog-friendly nature of the river valley is one of the reasons they chose to move here. Whether it’s a walk along the beautiful trails, a stroll on the beach in summer, or playing fetch amongst our wide open green spaces, there are plenty of fun activities for dogs and humans alike in our community. Here are just a few of the adorable pups who call Sarilia home. How long have you had Tucker and Peaches? We’ve had them since they were puppies. We adopted them from the U of S College of Veterinary Medicine. What are some of their likes and dislikes? They like food, sleep, and getting into trouble. 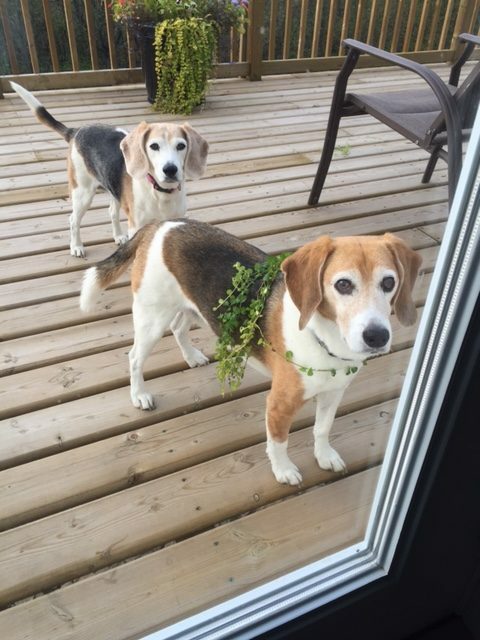 When they were younger they use to live to escape the backyard and run all over the neighbourhood, but now they’re a bit old for those types of adventures. They both hate the water and getting their nails trimmed. Do you have any funny stories about them? When they were younger they got out of our backyard in Saskatoon early one morning, so I called my mom to come and help me search for them. On her way over, she called me from her cell and told me she knew where they were. People were calling in to the radio station to report two little beagles running around the intersection at Avenue H and 22nd! Thankfully they were safe and I went and got them. When I got to work I was trying to explain to my boss why I was late and it turned out she had heard the calls to the radio as well and assumed it was them because they had been escaping so often. 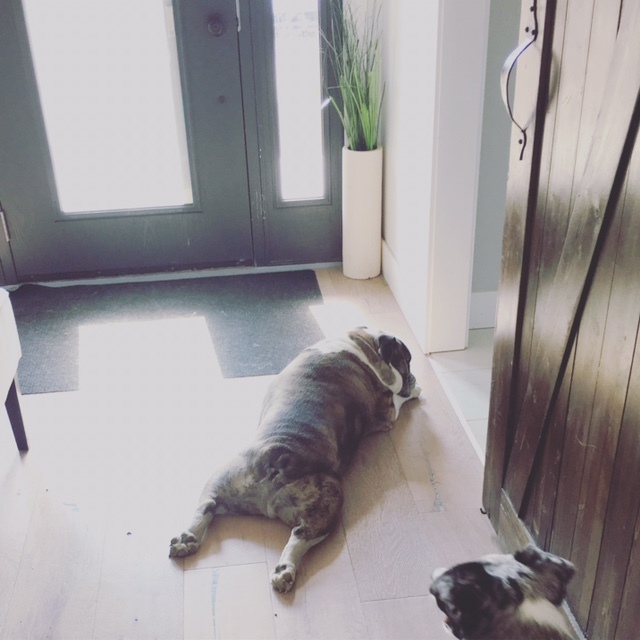 What activities you do with your dogs? Runs on the beach, walks on the trails, socializing with other Sarilia dogs, etcetera. 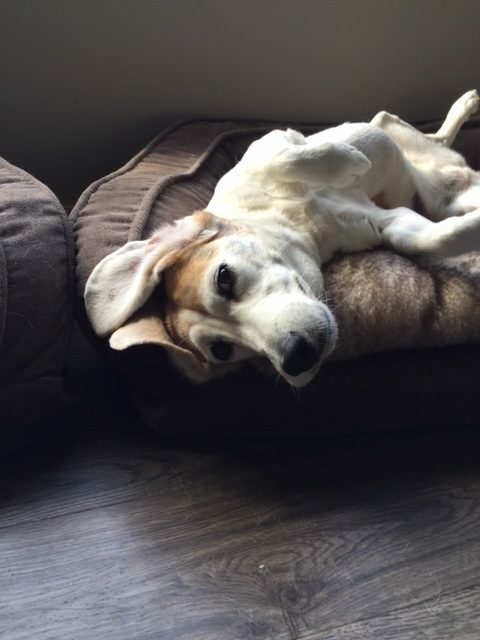 Unfortunately, the beagles don’t have as much pep in their step as they used to, so we usually don’t stray too far from home. They do love short walks though and every so often we’ll take them down to the river trails. They are 100% calmer since we moved out to Sarilia from the city. 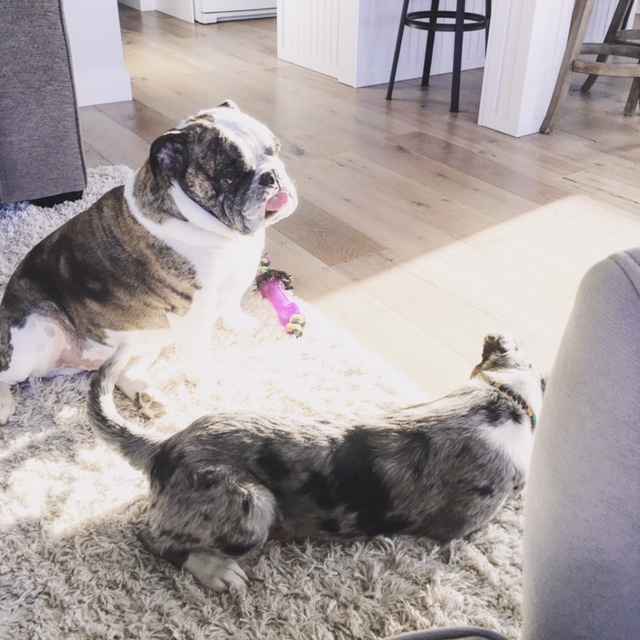 They used to be very anxious would constantly bark and howl at every noise, now they hardly make a peep. They love the quiet and serenity! 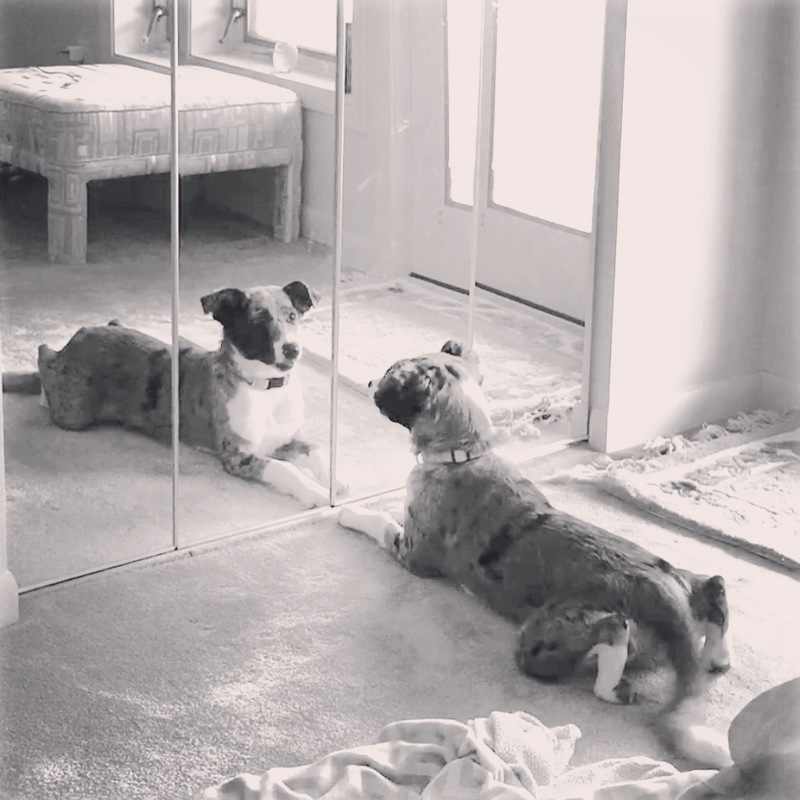 Tell us about your dogs. Halle is our 11-month-old hanging tree cowdog. She is conveniently name Halle because we adopted her on Halloween. She is a bundle of puppy energy and loves our home and everything it has to offer. She is an avid hiker on the trails and also loves the pasture when we go out to the horses. She is very eager to please and gets very down on herself when she messes up. She loves her buddy Mr. Brooks, but when he is sleeping she plays with our cat Lump. Teebo and Tuskie love walks and relaxing with us. They are our babies and they are both spoiled way too much! They enjoy going to the beach and playing in the water. Teebo just puts her paws in, but Tuskie walks right in up to his belly.